If you are looking for a hardy yet very attractive shrub Viburnum plicatum mariesii is one that is worth considering. Its performance through the year is outstanding. Layers of white lace-cap flowers in spring and good green foliage through summer to autumn. It then puts on a brilliant autumn display. 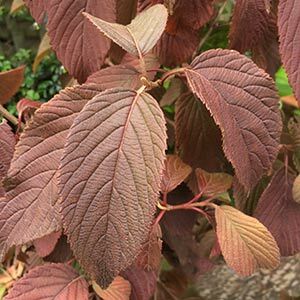 The foliage turns to reddish bronze in late summer, holds through to autumn before falling. Viburnum plicatum mariesii is worth a spot in the garden for the autumn tones alone. With a very attractive tiered habit, this is a plant for the front of the garden border where it can act as a feature plant as well as a partition between garden sections. Once established Viburnum plicatum mariesii requires little extra care. When planting prepare the soil well, digging in some well rotted compost. Consider the eventual size of this plant will be around 2 – 3 m in width, so give it appropriate space when planting near pathways and the like. Viburnum plicatum mariesii looks great when planted close to a lawn where it can be allowed to flow over the edges. Height – Will reach 2 – 3 m in height. Spread – Will spread over 2 -3 m.
Flowers – White lace cap in late spring. Foliage – Mid green and textured, turning to bronze in autumn. Mulch around the plant very spring after top dressing with a little blood and bone and watering well. Viburnum plicatum mariesii is available for sale at the following participating nurseries.